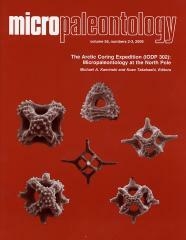 ABSTRACT: The Arctic Coring Expedition (ACEX) carried out in 2004 by the Integrated Ocean Drilling Program (IODP) afforded us the opportunity to obtain seawater and sea-ice samples at four different times and locations including the North Pole in the central Arctic Ocean.We performed taxonomic and census investigation on extant silicoflagellates in the samples. Of the two silicoflagellate taxa observed in the central Arctic, Distephanus medianoctisol Takahashi et al. sp. nov dominates over 71% of total silicoflagellates and Distephanus speculum (Ehrenberg) Haeckel 1887 represents only 29% or less. Significantly different silicoflagellate assemblages and skeletal morphology from the Arctic sea-ice laden areas compared to those from open oceans outside of theArctic were observed. During the summer, silicoflagellates actively grow in the central Arctic Ocean, as evidenced by considerable population densities even compared with those of the middle latitude open oceans. Active growth is supported by the number of observed double skeletons, which are good representation of active cell divisions. Underneath the pack ice, seawater of the central Arctic receives enough sunlight under midnight Sun conditions in summer, due to the presence of ice cracks and water puddles to provide sufficient photosynthetic energy to sustain silicoflagellate populations. The documented percentage occurrences of aberrant silicoflagellates (abnormal forms) are high when compared with those from the pelagic environments. Unusual forms with greater than one apical window (also considered as aberrant) are also noted and theymay have been formed due to specific environmental conditions such as low temperature, the presence of sea-ice, and low light intensity (beneath sea-ice with snow accumulation).